Lucy was born in Canadian Zoo where she learned basic zoo skills like ice-skating and archery. She was quickly befriended by a skunk named Lamar, who taught her how to love. 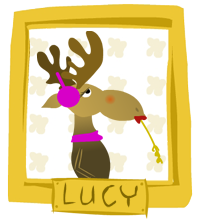 Lucy came to Hollywood chasing a film career, however she quickly gave up her Hollywood dreams when she found out that Caribou get all the good film roles. Fortunately, The Rich Morning Show called when they needed an animal with fish pistol training. In her spare time, Lucy reads romance novels and eats hay. She and Lamar also run a rescue shelter for baby pigeons in Ventura. Lucy’s favorite color is pink and she rides a tricycle to work.